Cavilock - the Best Pocket Door Hardware - Looking for high quality door hardware for your pocket door system? Cavilock has what you need. Find the highest quality pocket door locks as well as pocket door track, barn door, exposed track sliding door systems. Improved Direct Door Hardware Website - We continually make improvements to our website to make it easier for you to find the door hardware you need. In addition, we have added more door hardware help articles and added more information to help you find exactly what you need faster than ever before. We'd love to hear your feedback about the recent changes we have made. For nearly 15 years we have been serving home owners, builders and designers across North America and around the world. We'd love to work with you on your next project. Baldwin Door Hardware We now offer the entire line of Baldwin door hardware including the new Baldwin Reserve Series. We also have the complete estate series available. Some Baldwin items are special order, depending on the style and finish you need. If you need some specific Baldwin handles, please give us a call and we can verify availability. Emtek has just come out with some great new keyless locks. You can choose from Emtek's keyless deadbolt or the new keyless lever available in multiple finishes to compliment with your other Emtek hardware. Also check out the new Emtek stainless steel modern style bath accessories. Emtek continues to release new and innovative products which we try and add as soon as they are availables. If you can't find an Emtek product you need, please give us a call. Schlage as always is a leader in the door hardware industry because of their reputable name and quality products. We offer the entire line of Schlage door knobs, levers and handlesets. Be sure to check out the new Schlage Latitude modern lever. We're working on adding the rest of Schlage commercial door hardware and will be adding Schlage Dexter soon. Kwikset is also a leading supplier of door hardware throughout North America. Direct Door Hardware is pleased to offer the entire line of Kwikset products. Most Kwikset items ship within 1 business day. Kwikset makes it easy to replace door hardware by offering locksets that include parts to replace just about any other brand that fits standard door prep. Kwikset also offers a revolutionary smartkey system on their keyed locks to simplify the process of replacing a lock. Simply order a Kwikset lock with smartkey keyway and you can rekey to your existing door hardware by simply inserting your existing key into the Kwikset keyway. Sure-Loc door hardware has long been a best selling line at Direct Door Hardware. With Sure-loc you get a great product for the money. We've sold thousands of Sure-loc door knobs around the country and we've been pleased with their dependability, not to mention the popular styles and finishes that are offered at such a great price. Be sure to check out the new Oslo Modern Lever. 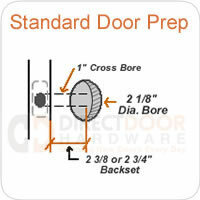 Home Builders - Save big and buy your door hardware from Direct Door Hardware! First, you'll save tons of time that you would have spent driving around town to find exactly what you need. Since we can ship directly from the manufacturer, our doorknobs are nearly always in stock and ready to ship. We key most orders for free, and if you live outside of Wyoming there is NO SALES TAX! Depending on the number of homes you build a year, that can add up to thousands of dollars. We'd love to quote your next project. Contact Us for help by email or at 307-886-9449.